St. Louis, MO—On Wednesday, March 23, 2016 Fred N. Sauer placed this ad in the St. Louis Post-Dispatch to invite St. Louisans and Missourians to a presentation that will address a looming economic crisis. Through millions of dollars of political contributions, Rex Sinquefield and others are determined to merge St. Louis City with St. Louis County. This disaster would burden St. Louis County residents with the bad management and fiscal disasters of the City’s government—both their past mistakes and the inevitable future results. If successful in this plan, St. Louis County residents will feel the very real consequences of years of terrible City policies, and we will be left with the Chicago of Missouri in the control of Rex Sinquefield. 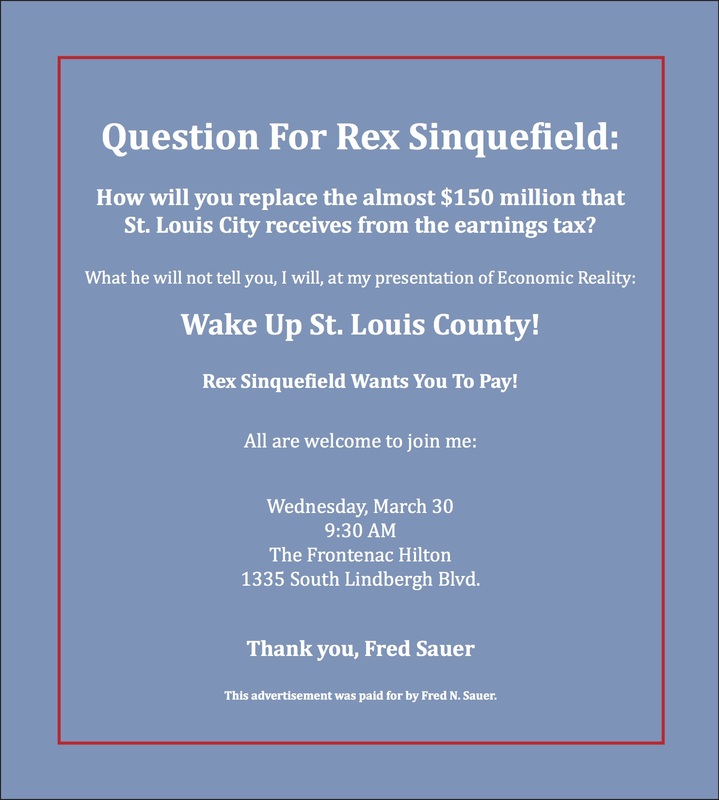 At this upcoming event, Fred Sauer will present significant research about the current economic peril in which Rex Sinquefield and his plans have placed St. Louis County residents. Wake Up St. Louis County! Rex Sinquefield Wants You to Pay! All are welcome to attend. Thank you.